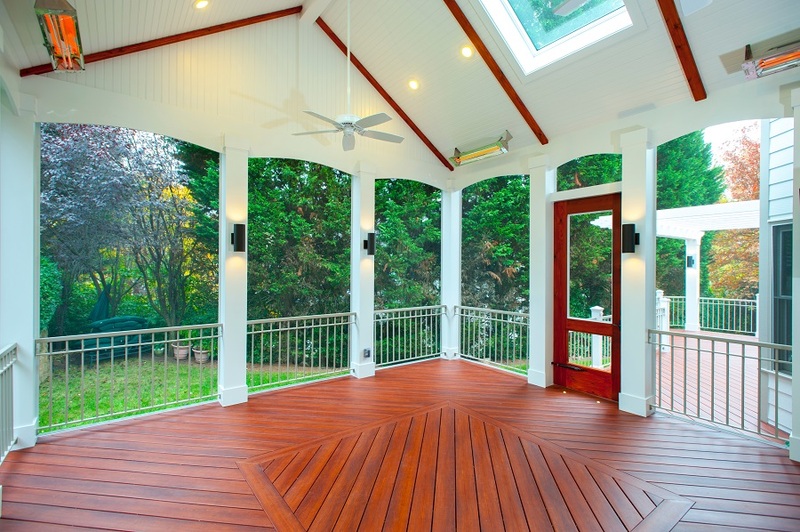 Decks, screened porches, and patios have limited use in Maryland and Virginia because of the way the DMV experiences four distinct seasons so distinctly. While superb for breezy summer days and spring barbecues, it's admittedly difficult to subject oneself to near-freezing temperatures and strong winds on a covered patio during the transitional months and still be comfortable for more than a few moments. Outdoor infrared heating systems, like those offered by Infratech heaters, offer a solution to homeowners seeking to maximize the versatility and usability of their outdoor space. It's understandbly frustrating to spend the time, money, and effort to construct a screened-in porch or veranda only to be limited by the weather and temperature; outdoor heating systems, through the use of electric outdoor heaters, extend the habitable period of outdoor spaces by months. One of the main ways outdoor living spaces are limited in Washington, DC, is through the temperature. A sweltering, mosquito-infested summer will often abruptly lead to a blustery fall. This means temperatures can swing from eighty-five to sixty-five practically overnight. In a place with distinct seasons, there isn’t always a lot of gentle descent into the next climate phase. Quick weather changes and a lack of “in between” temperatures can make outdoor spaces a bit difficult. That is, after they’re uncomfortably hot in the summer, they’re almost immediately uncomfortably cold with the fall temperature dip. How to combat the weather in Washington, D.C. If you find your outdoor space isn’t as comfortable as it could be due to cold weather, there are solutions to prolong the use of that outdoor space. The easiest and most straightforward method is installing heaters. Infratech heaters are great at allowing you to use your outdoor space during the shoulder seasons. When it’s just too cold to sit comfortably outside, Infratech infrared heaters can take that chill out of the outdoor space and make the area comfortable—especially during cold mornings and nights. If you do choose to install infrared heaters outside, there are a number of distinct benefits. Many people think of using outdoor spaces during the summer, but in Washington, DC, those areas can be plagued by high humidity and lots of bugs—particularly mosquitoes. Outdoor living spaces are fantastic for entertaining. They provide the charm, ambiance, and amenities of inside the home with the added benefit of being outside in the fresh air. Having these infrared heaters means you can plan a party during shoulder seasons without having to be so concerned about the possible temperature fluctuation and the comfort of your guests. Obviously the heaters can’t combat extreme temperatures, but they can certainly buffer those chillier times. Infratech heaters aren’t just for residential spaces. They are also used to great effect in the commercial sector. Restaurants, for example, can have uninsulated covered patios with Infratech heaters installed in order to keep that dining area comfortable and viable year round. To truly combat the cold, the key for any commercial or residential space is to block the wind and cold air. That wind chill is what makes the space truly uncomfortable, so if you can effectively block that, Infratech heaters can then buffer any remaining chill.